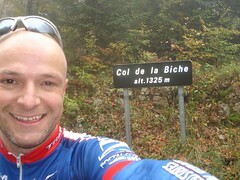 Col de la Biche (Biche = Doe, a deer, a female deer) is in the Jura mountains on the same stretch as the Grand Colombier. 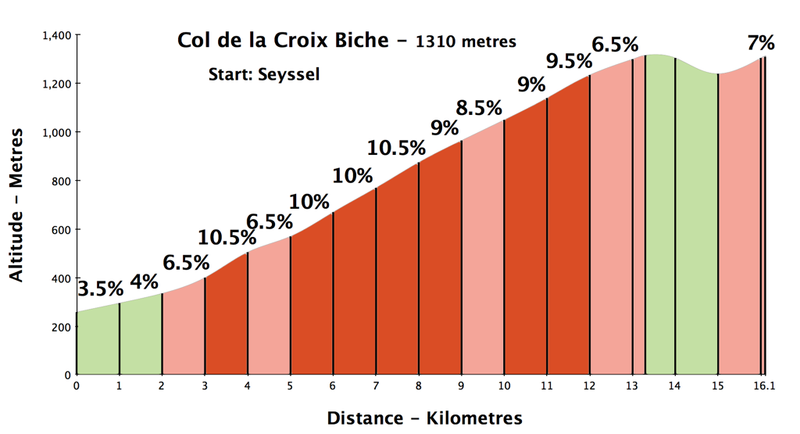 My cycling bible: “With more than 1,000 metres of climb and its slopes averaging more than 10% for some kilometres, The Col de la Biche is the crazy cousin of the Col du Grand Colombier.” Yes, this is a steep climb – known for its wide, clear views of the French Alps. If only I could get above the clouds……. Often when it is overcast in Geneva, if you go high enough in the nearby mountans you can get above the clouds and find brilliant sunshine. I was hoping that might happen today, but instead the last few kilometres of the climb were in deep fog. There are two peaks. 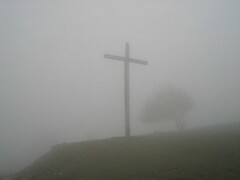 The first peak is the Croix de Ramban (see photo), then a short steep descent with a bunch of white cows blending into the fog, and then a kilometre climb to the Col de la Biche.